"I've taken a lot of useful knowledge from the seminar! Thank you very much!" "�Gave me a great insight into what various templates and variables can do for the look of our store. Great resource manual as well." "Thank you! Very well done!" "I was at your convention in NY and wanted to thank you. I think that both you and Michael did a wonderful job." Join recognized Yahoo! Store experts and authors Istvan Siposs, Rob Snell and Michael Whitaker and fellow Yahoo! Store merchants for this exciting new seminar. During this intensive 2-day event (one day class + half day lab) we will be focusing on strategies and tactics to help you run a more profitable Yahoo Store. Thursday, February 6, 2003, San Francisco, CA. February 7, 2003, San Francisco, CA. Advanced Yahoo! Store Seminar: Friday, November 1, 2002, New York. Advanced Yahoo! Store Seminar: Friday, November 8, 2002, Los Angeles. Advanced Yahoo! 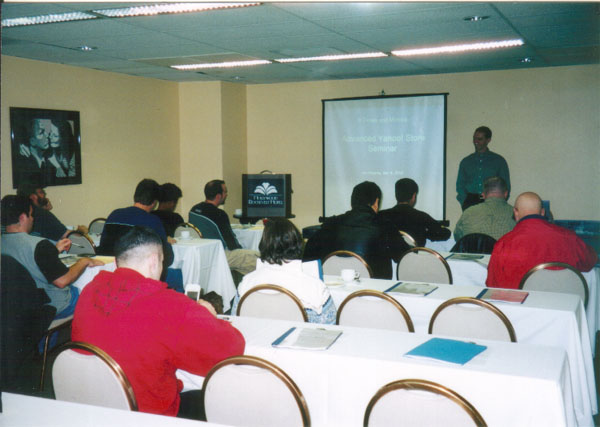 Store Seminar: Saturday, September 14, 2002, San Francisco. March 20-21, 2003. Denver, CO.
June 5-6, 2003. MicroTek Labs. September 4-5, 2003. MicroTek Labs. Get up to speed on the issues surrounding the upgrade to Yahoo! Merchant Solutions.